When I first heard that my son’s upcoming first grade teacher was dying of colon cancer, my immediate reaction was to do everything to shelter him from the experience. But I was wrong. Over the year, we met Katie, submitted homework assignments and had parent teacher conferences. 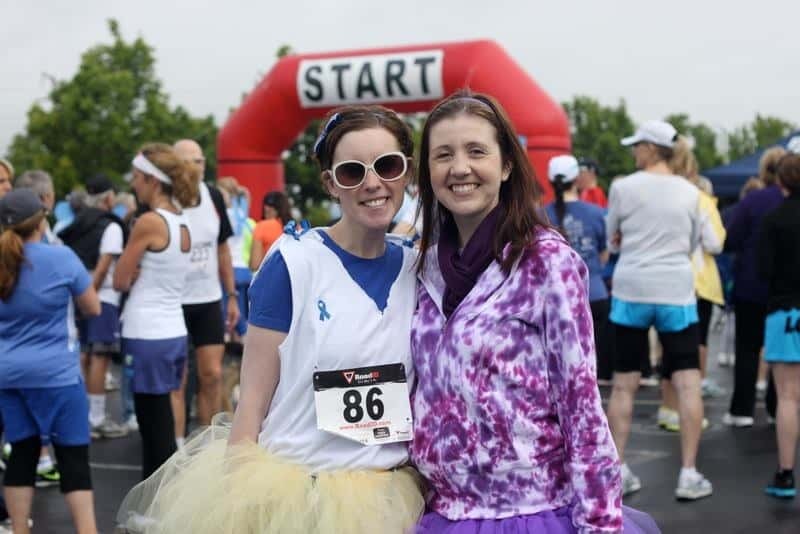 Our family ran two 5K’s in support of Katie and cancer research – the first with her and her Purple Power support team (that’s Katie below on the right). At the second race, just a few months later, Katie stayed home as she was just too tired. But Purple Power was out in force. The consummate teacher, Katie made her personal experience her final lesson plan. Parents in her classroom answered some very hard questions from their kiddos. The children started understanding their parents’ grief and learned that it was OK. We all finally had to find a way to explain that, “no, Ms. Tinnea is not going to be able to get better.” At six and seven years old, the kids learned a lesson about the preciousness of life well ahead of schedule. Before the end of the school year, we found ourselves in a church packed with kids wearing purple. My kids saw me cry for the first time. Yesterday, 49 members of team Purple Power ran the Get Your Rear in Gear 5K in memory of Katie. This month’s Atticus 1% For Good was contributed to that organization’s efforts to find a cure for colon cancer. Katie’s husband, Ryan was there along with her daughter, Kennedy. Kennedy turned 3 this year.